Transcribe Anywhere is a course that’s been put together by a lady named Janet Shaughnessy & it claims it can help you to learn how you can launch your own successful freelance career as a transcriptionist. You’re led to believe that you can sign, follow one of the courses & then get instructions on how to begin finding work so that you can start getting paid – but is it all actually legit or is Transcribe Anywhere a scam that’ll just see you wasting your time? What Exactly Is Transcribe Anywhere? As I briefly touched on above Transcribe Anywhere is a transcribing course & it’s been put together by a lady named Janet Shaughnessy who also happens to be the owner of a company named Zoom Transcription Services. Janet’s courses sold through the Transcribe Anywhere website claim they’ll help you learn how to transcribe with excellence & you’re led to believe that you’ll get access to everything you could ever need to build a successful career as a professional transcriptionist – whether that be a freelance career, an career working for somebody else or even venturing into launching your own full on transcription business. The key areas Janet’s training focuses on are general, medical & legal transcription services – which I think you’ll agree pretty much covers all bases, but the medical & legal courses specifically certainly seem to be generating a lot of interest. So essentially you’re led to believe that you’ll be able to buy one of Janet’s courses & that after going through it you’ll be able to land a high-paying transcription job which should hopefully enable you to earn enough to recoup your training investment & earn a good income on top. So for that reason I figured it’s probably best if I take a moment to explain it before diving in & getting into detail about Janet’s course. Basically transcribing is just the task of putting what you hear into writing – so as an example you could be provided with an audio or video clip where you’ll be required to type out exactly what you hear. Those are just 2 simple examples, but transcribing is often used in legal & medical situations & this is where the main money lies. For example you might be asked to transcribe a video which will be used as evidence in a court room, or to transcribe a recording of surgery that had taken place so that it can be documented in the event it ever needs to be looked back on. Ultimately it’s a fairly easy task but there are some things that will make you more desirable to employers, such as the obvious things like how fast you can transcribe things & with how much accuracy you can transcribe them. There’s actually a couple of different courses Janet has on offer & I’m not going to lie when I took a look at the prices I did get a bit of shock, it’s safe to say that to any sort of budget they’re pretty expensive… However, if they’re actually as good as promised & if they’ll really land you the high-paying jobs they claim they will then I guess a big outlay might not be all that bad right? The problem is how do you know before you buy them? Well thankfully with Transcribe Anywhere that’s not actually such a problem because Janet offers what she calls “mini courses” and these are free. The mini courses are basically taster courses that give you an idea as to what the full courses they have in store. They let you try it out & see if it’s right for you – after all Janet’s style of teaching may not even be a good fit for you, everybody learns different & you don’t want to have to waste a huge chunk of money just to find that out. I’ll admit that the mini courses don’t really go into massive detail on actually how to transcribe itself, but they do give you an overview of what it all involves & what you can expect. Plus as I say they also give you the opportunity just to get a feel for Janet’s teaching style. This free mini-course is not training, nor is it a sneak peek into our full course content. It’s an overview of the industry along with foundational information to help you in your decision on whether or not to pursue it for yourself. What I have to say about this whole thing is that I like the honesty here. They are not selling you into the program on false hype or anything like that, Janet is being honest about what she is offering. Sadly that can often be quite hard to find online. So what do you get with these in return for their fairly high prices? Well, actually you get pretty much everything you need to get going with transcribing. The self-paced course includes video training, worksheets, cheat-sheets & transcribing work for you to practice on to prepare you for the real thing. You’ll also get a lot of personal tips & tricks from Janet herself, and once you’ve paid the money you’ll get lifetime access which means if ever she updates the course you’ll be able to access the updated material. On top of that you’ll get access to a support group on Facebook too where you can ask any questions. Now, the important point here is there is no guarantee that you will get a job from all of this. Essentially the money could be completely wasted… Transcribe Anywhere explicitly state “we are not a job placement agency” however they do give you training on how to find work as a transcriptionist. Will the course help you get a job, in terms of qualification? It’s unlikely – but the idea is that after going through the course you will have much more confidence so that when you do approach a potential employer they’ll be much more willing to hire you based on the idea that you know what you’re talking about. My Verdict – Is Transcribe Anywhere a Scam? No, as far as I’m concerned the Transcribe Anywhere website is certainly not a scam – at the end of the day it is exactly what it says it is, a course that has been designed to help you become a transcriptionist. Whilst the course is pretty expensive I do feel that Janet is pretty honest in the way that she sells the course & there is no guarantee being made of you getting a job. You get training to help you find work, but ultimately it is down to you to make it happen. The reality here though is that to be honest you don’t really need this training to become a transcriptionist, but the concept is that if you do get it then according to Janet it will put you in a better position to find work because you will be more confident & know where the best places are to find jobs. So it is down to you to take the mini course, see what you think of it & decide whether or not you think it will be worthwhile the investment or whether you think you can go it alone without her training. Overall though it all definitely seems legit & Janet is clearly an experienced person when it comes to transcribing so you’re definitely learning from an expert. I think if transcribing is something you’re really interested in & you have the money to spare then her course will definitely put you in a good position to get started. Insider John Binary App 810 Review – Scam? 1 Minute Windfalls – Scam or Legit Way To Make Money? The TRUTH About It All! Charity Profits Review – Is It A Scam? 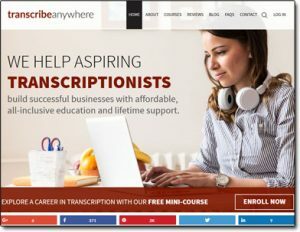 4 Responses to "Transcribe Anywhere Review – Scam Course or Legit Way To Learn Transcribing?" There is a minor error in the review. Janet’s course does NOT cover medical transcription at all – only general and legal transcription. If you are a native-English speaker, you might have a chance to get jobs in this field. If not, think 100 times before enroll. You can get great at punctuation and grammar, but i promise you it will never be enough.